The gorgeous surroundings of the Dordogne offer plenty of opportunities for wonderful walks and bike rides. 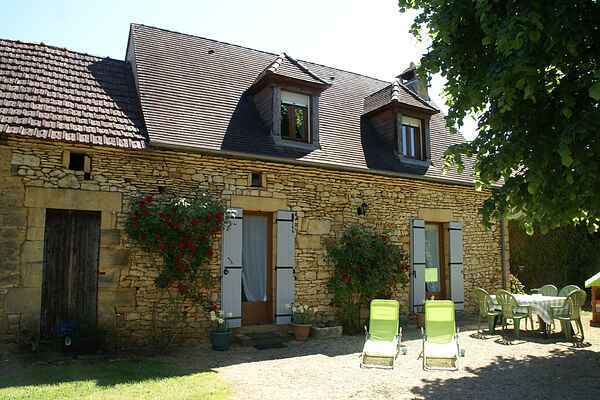 Here, just ten kilometers from the well-known Sarlat-la-Canéda, is the Prats-de-Carlux, a holiday home built in 1817, with a beautiful gravel terrace and charming meadows. The children can enjoy the swing, slide and sandbox. And your day is complete with a lovely game of \"jeu-de-boules\" on the gravel path. In the cool living room, you can relax marvelously next to the wood stove in the fireplace. The holiday home is ideally situated for excursions. The Dordogne River flows just a short distance from the house. You can explore this river by canoe or kayak, or go fishing or swimming swim instead. The quaint town of Carsac-Aillac (12 km), with its beaches, outdoor cafés and restaurants is definitely worth the trip. A golf course can be found in Vitrac (15 km). The children would love a day of swimming in the large lakes of Tamniès (18 km) or Gourdon (22 km). And don't forget the medieval castle town of La Roque-Gageac, Domme en Beynac (22 km) and the prehistoric caves of Les Eyzies and Lascaux (30 km).